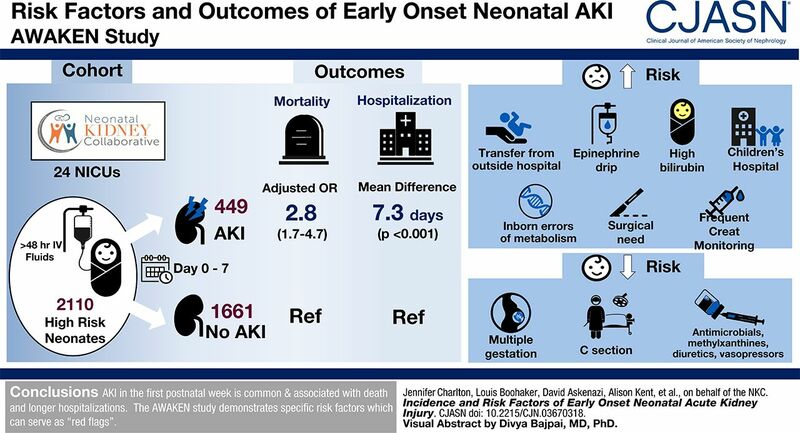 Background and objectives Neonatal AKI is associated with poor short- and long-term outcomes. The objective of this study was to describe the risk factors and outcomes of neonatal AKI in the first postnatal week. Design, setting, participants, & measurements The international retrospective observational cohort study, Assessment of Worldwide AKI Epidemiology in Neonates (AWAKEN), included neonates admitted to a neonatal intensive care unit who received at least 48 hours of intravenous fluids. Early AKI was defined by an increase in serum creatinine >0.3 mg/dl or urine output <1 ml/kg per hour on postnatal days 2–7, the neonatal modification of Kidney Disease: Improving Global Outcomes criteria. We assessed risk factors for AKI and associations of AKI with death and duration of hospitalization. Results Twenty-one percent (449 of 2110) experienced early AKI. Early AKI was associated with higher risk of death (adjusted odds ratio, 2.8; 95% confidence interval, 1.7 to 4.7) and longer duration of hospitalization (parameter estimate: 7.3 days 95% confidence interval, 4.7 to 10.0), adjusting for neonatal and maternal factors along with medication exposures. Factors associated with a higher risk of AKI included: outborn delivery; resuscitation with epinephrine; admission diagnosis of hyperbilirubinemia, inborn errors of metabolism, or surgical need; frequent kidney function surveillance; and admission to a children’s hospital. Those factors that were associated with a lower risk included multiple gestations, cesarean section, and exposures to antimicrobials, methylxanthines, diuretics, and vasopressors. Risk factors varied by gestational age strata. Conclusions AKI in the first postnatal week is common and associated with death and longer duration of hospitalization. The AWAKEN study demonstrates a number of specific risk factors that should serve as “red flags” for clinicians at the initiation of the neonatal intensive care unit course.